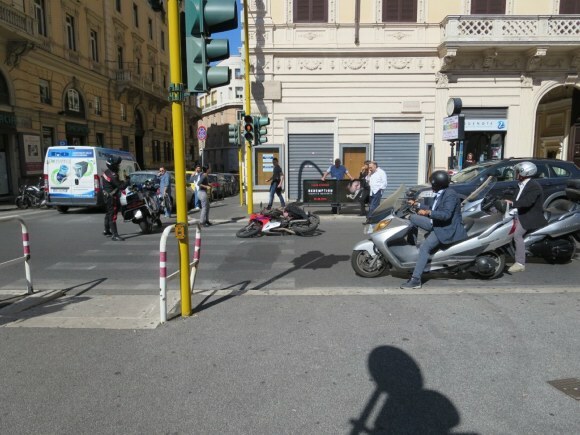 Motorini Down: On our visits to Italy we normally see at least one accident involving a motor scooter. It did not take long on this trip. Normally we see them pick up the motorini and drive off. In this case the motorini was going nowhere as it was leaking fluid all over the street. The rider was a very attractive young girl who was screaming at the driver who made a right turn in front of her and knocked her off her bike. 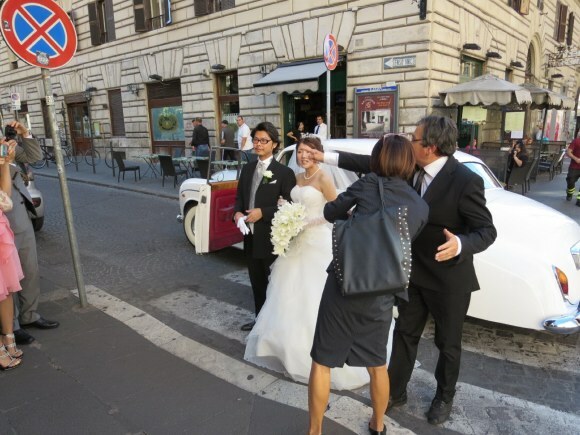 She seemed OK.
Japanese Bride: We often see weddings in Rome and lots of people seem to have them as destination weddings. This bride and groom came a long way. That is a white Rolls Royce. 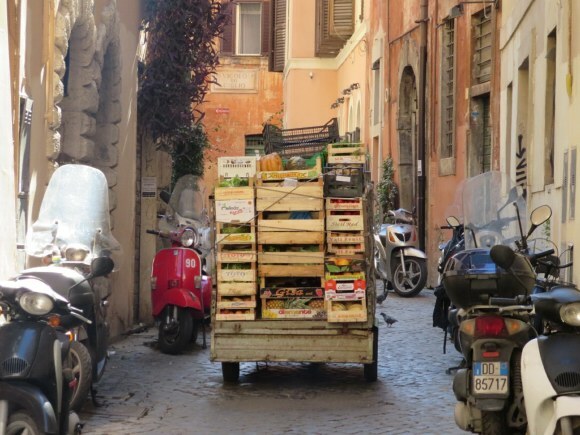 Vegetable Truck: The market at Camp di Fiori was closing down and this tiny truck was hauling the day’s unsold vegetables away. 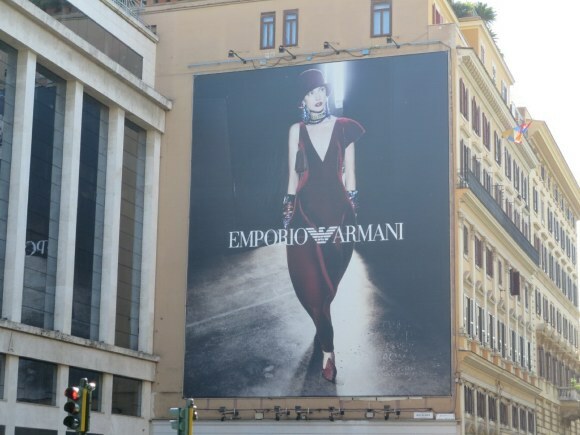 Armani: For those of you who have read the updates over the years you know about the Armani ads near our apartment. They seem to change with the frequency of our visits. I have decided to start to rank them. This will be based upon a number of things. A first criterion is whether it is male or female or a combination. Male ads get a zero. Second, we will look at the amount of skin showing. No skin equals a zero. Next will be the number of calories the model consumes per day. If it looks like they consume less than 10 calories per day – zero!! Score for this one – 3 and that is only because model is female and I like women in hats. The shapeless dress is horrible. Makes her hips look huge and she has no breasts. 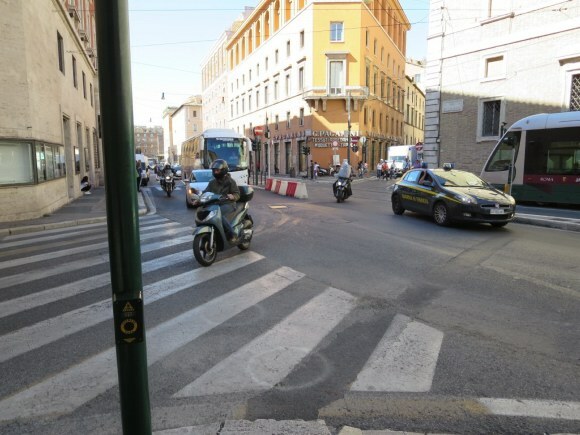 Dangerous Intersection: The King and Queen used to like to stand at the Piazza Venezia where about six streets intersect and there are no traffic control devices – no stop lights and no stop signs – just chaos. Now we have a new one. Just two streets intersect and there are traffic lights but they work in an odd way – both intersection streets have green lights at the same time. In the photo, the traffic on the street at the left can either turn right or go straight ahead and the traffic on the street on the left can either go left or cross over and go to straight ahead. This means that the traffic crosses with both having the right of way. Old Photos of Rome: We love the old photos of Rome that show how it has changed. 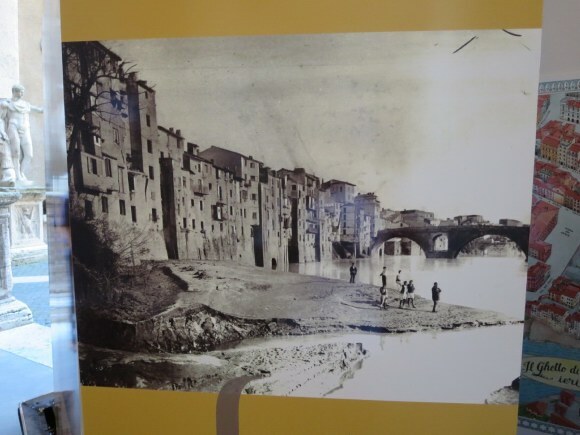 In walking near the ghetto one day we wandered into a photo exhibit and among the photos was this one taken sometime before the lungotevere, the wall to prevent flooding, was built. This picture is near where the Jewish ghetto was. The location was selected since it was not desirable land as it frequently flooded. Ghetto Bird: We were sitting and people watching in the ghetto when the woman sitting next to us got hit right on the head by some bird guano. The Queen always carries wipes and we came to the aid of the young lady who actually had stuff for her baby. 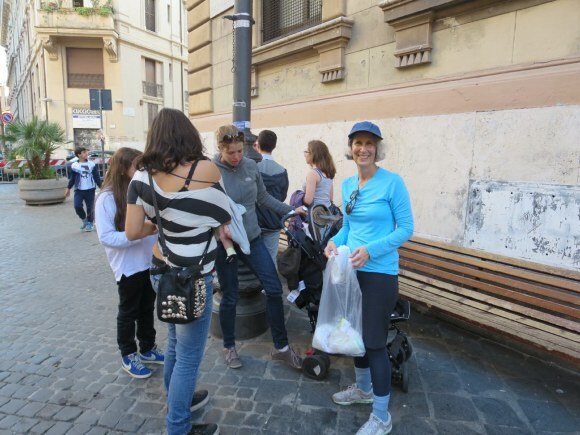 She was from Israel and was visiting Rome for the first time. 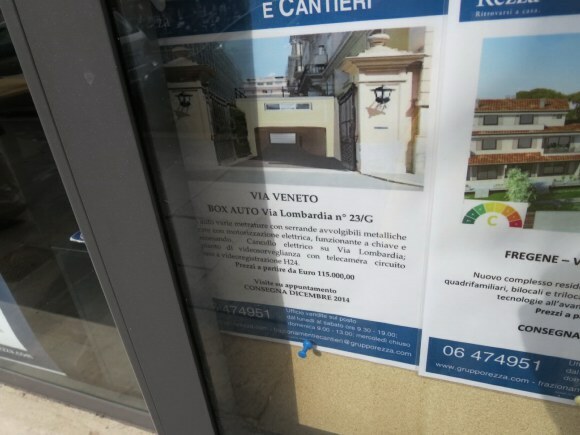 For Sale One Box: In Italy a garage is called a box and they are bought and sold like houses. This one was advertised for sale for 115,000 euros or over $150,000. It does come with video surveillance.